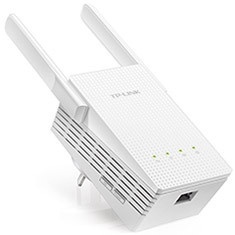 The TP-Link TL-RE210 AC750 Wi-Fi Range Extender boosts your wireless signal, eliminating previously inaccessible areas or "dead zones". It supports all 802.11 a/b/g/n/ac standards of WiFi routers and wireless access points and its compact, wall-mounted design allows for easy, flexible deployment. With Wireless AC technology, the RE210 delivers combined dual band speeds of up to 750Mbps.